Textures, colours and shapes in the natural world are my primary source of artistic inspiration. Like a lot of Australians who live with the devastating effects of periodic drought, I hold an enduring fascination with water and this fascination is often translated into my choice of colour and subject matter. I simply adore handling, looking at and using semi-precious stones and increasingly geode druzy slices. The feel, texture and colour of semi-precious stones has fascinated me for most of my life. I do not have any art training at all so I developed my own "style" very quickly through the process of trial and error and very long hours in my studio. I adore the freedom I have discovered in freeform bead embroidery. I love the fact that I do not start with any patterns at all; just an "idea" that comes to me in my dreams. I admit that I dream a lot about beads and their possibilities ... I do not look at "mistakes" as such but more so as profound learning opportunities to enhance techniques and develop my own way around a particular issue. On a more mundane level, I only took up beading in April 2013 as a way of trying to "cure" my problematic dyslexia. As with most skills in this life, I am self taught with beads. Whilst this new activity has not helped much, beading has provided me with a new artistic outlet that is so different from my pastel paintings. 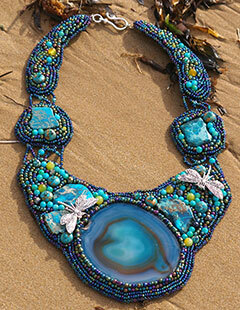 Beading has become a pleasant addiction for me and I create something every day in my studio. I sell online through Etsy (The Sage Wreath). 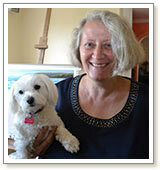 I also sell in an art gallery in Victor Harbor, South Australia and I sell privately out of my studio here at home. I also take on commissions, largely from the benevolence of a supportive American market. I am unknown in Australia. I also do exhibition work in the more enlightened art exhibitions here in South Australia to expose my one off creations to members of the public who are starting to become educated about the potential of beads. Inspiration for this design was the sound and smell of softly running water during a hot summer and the intermittent buzz of insect life hovering over the cooling water on a scorcher of a day. I am heavily influenced by natural scents in the Australian bush. I saw the druzy geode agate slice online and the design possibility was immediately revealed to me though my imagination. I hunt the world over for suitable cabochons but they must "speak" to me the moment I lay eyes on them. I never use patterns for my work. Each piece is designed with the needle only. I adjust the size and shape of each creation throughout the laborious sewing process. This is done visually only as I do not want to restrict my creativity in any way at all. I use my self-taught knowledge of pastel painting in my bead design work. Careful consideration is always given to colour, form, texture and tonal values to ensure I am 100% satisfied with my work in progress. As with my paintings, all these elements must be present in each piece I create. I also suspend any form of "fear" as this does not feature in my vocabulary. I just sit down and start. All my works are negotiated along the way and if something does not look "right," I simply snip the threads or pull them and start again. Dragonfly Billabong took me around 6 weeks from start to finish as I had to stop and consider placement, colour, tonal values and textures along the way to ensure balance in the finished piece.